Despite all of the madness of the last few weeks, I have finally managed to finish my Chevron Quilt for the British Quilt and Stitch Village, which opens on the 26th of April in Uttoxeter. It was my first time using solids only, and I rather liked them, and as I had quite a few large pieces of leftover fabric I sat down one afternoon, and started sewing strips of them together. I cut them into 12.5 inch squares around my ruler and when I ran out of scraps, I decided to buy some more in purples and blues, and kept going until I had 20 squares. So after chopping them up I ended up with some alternating chevrons. Well, that was at the start of September, so I procrastinated for a month of two, put on a white border, and then continued to procrastinate for a further 5 months, until the deadline for the show loomed. So in a state of extreme homelessness, and when I should have been harassing Estate Agents and Solicitors I decided to escape to this lovely place in Hinckley for the afternoon. It was great, I had a nice chat to one of the owners, Fay, did a little quilting, and realised I didn't want to heavily quilt it, so it was feasible to get it finished for the show. I can neither confirm nor deny that I celebrated news of exchanging contracts with buying a little fabric :o). a finished quilt, and I can honestly say I love the front AND the back. Some of the not very straight line quilting doesn't bother me either, as I have finally finished it- thank goodness, I was starting to bore myself with all of the procrastination, well it has been nearly a year of fannying! 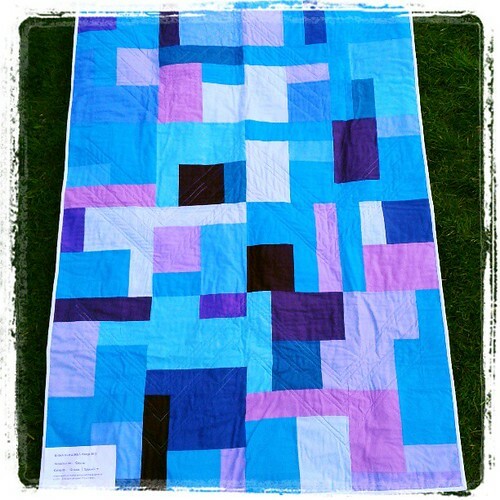 Well done on your lovely finished quilt, especially with so much going on in your life... It's going to be a lovely show with quilts like that in it, I'm sure!! I love the colours you have used, simply stunning. You are Katy will be shocking the good folk of Uttoxeter! 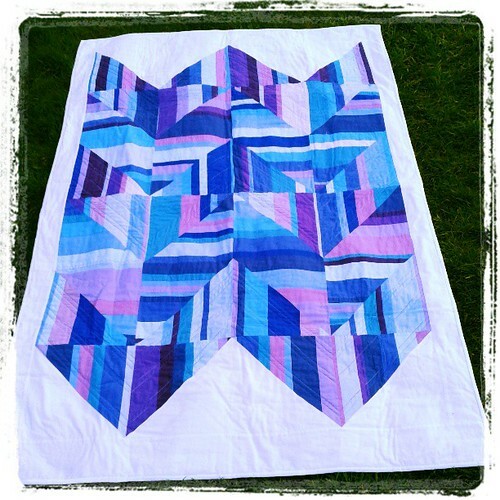 It's beautiful Ange - a fab finish and I love solids! Yummy quilt - well done!! And yay (?) to neither signing or not signing a contract!! Woot! I was going to say I take it it was being hand delivered, seeing as I paid a fortune to get it there for Monday! Oh I used to live near Uttoxeter. It's a bit too far now. Beautiful quilt. Well done you! Amazing to get it done and buy and sell a house at the same time! It is gorgeous and well worth the fannying around! A finish is always grand! I love the chevrons, you did a great job. While blues aren't on my list of favorite colors, these do look good together. Yay! You got it finished. So pleased and it looks brilliant. Wish I could go to the show with you. it's lovely! well done you. are you going to the show then? I've not seen that top quilt before, It's really unusual, I'd definitely go to a class to make something like that! Looks great. Good luck with the show - you'll need some time off after unpacking all those boxes!!!! Good luck in the show....take lots of pics of everything you see, then it will be like I was virtually there! It is just stunning! LOVE it!!! I enjoyed seeing your quit today, it looked stunning. There are some lovely quilts to view and fabric to fondle, on the trade stands. I wish I'd bought more.